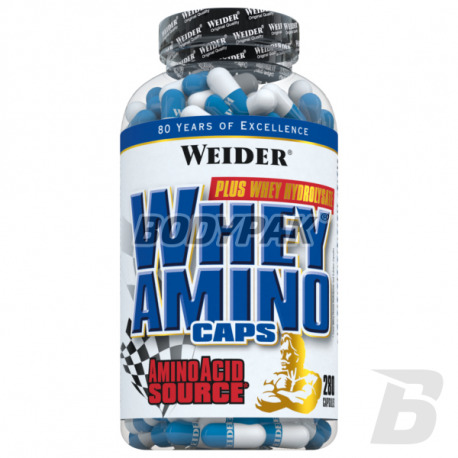 Amino AcidsWeider Whey Amino Caps - 280 kaps. Weider Whey Amino Caps - 280 kaps. Dietary food designed to meet the needs of intensive work of muscles, especially for athletes or physically active. Swallowable capsule comprising a whey protein hydrolyzate. 238 loyalty points Your cart will total 238 points that can be converted into a voucher of 9,52 PLN. High quality supplement based on whey protein hydrolyzate, making amino acids in a short time reach your muscles! 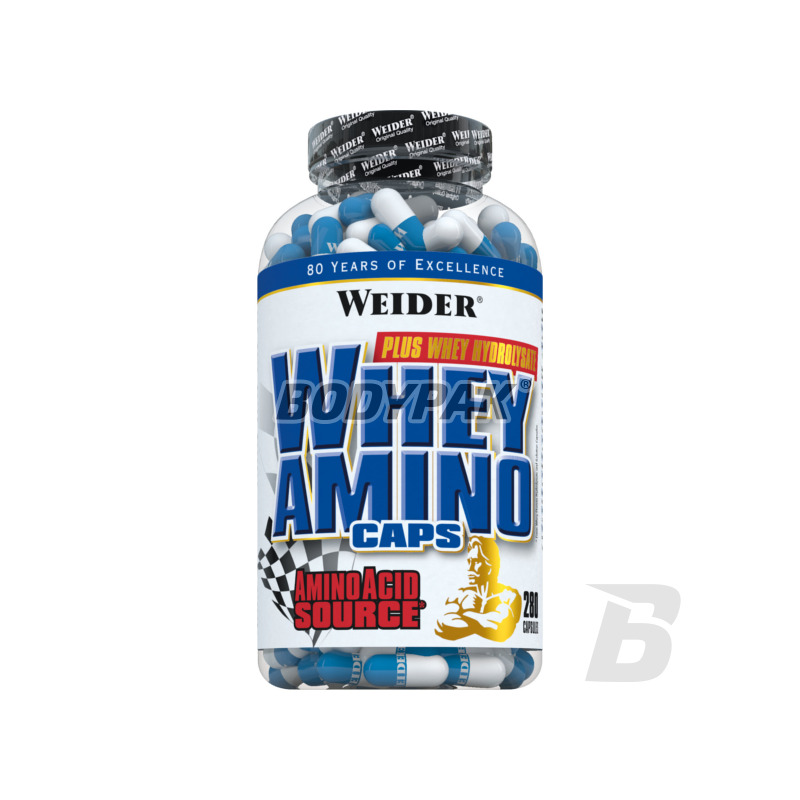 Weider Whey Amino Caps formulation is based only on the high-quality amino acids derived from whey protein. They provide a nutritious source of protein, which are necessary to maintain the full and speedy recovery and development of muscle tissue. Does not contain any vegetable protein! It is a dietetic food is intended to meet the needs of intensive work of muscles, especially for athletes or physically active. Swallowable capsule containing a whey protein hydrolyzate - so that leak into the bloodstream shortly after ingestion! 5 caps. Before training, 5 caps. After training. Ingredients: a whey protein hydrolyzate 83.6% gelatin, anti-caking agents: magnesium salts of fatty acids, silicon dioxide; emulsifier: soy lecithin ; dyes: E171 and E132. It contains lactose. You love the feeling of pumps in training? With the formulation, more correct it, which not only result in a significant improvement in well-being, but also to a better oxygenation and nutrition of tissue. It affects the regeneration! High-grade amino acids BCAA about the sensational taste and solubility. Inhibit catabolism, supports regeneration and move away the feeling of fatigue in training! Bet on somehow! USN BCAA Syntho Amino Stack - 240 kaps. Activlab Chicken Protein Amino Caps - 240 kaps. High-quality poultry protein hydrolyzate! Amino acids with increased proline content will give you the power and the building blocks to build better muscles and joints. Thinking about your health and effects! Hi Tec Taurin - 100 kaps. Taurine is an amino acid which occurs in larger concentrations in muscle, liver, brain and central nervous system.